All parts are easily removed for cleaning or replacement. Innokin iClear30S is dual coil clearomizer with a replaceable atomizer head, making it very inexpensive to maintain, while providing huge amounts of vapor and flavor. It has 8 long wicks (4 per coil) housed in a perforated tube for more consistent flow of juice to the coils in any position. 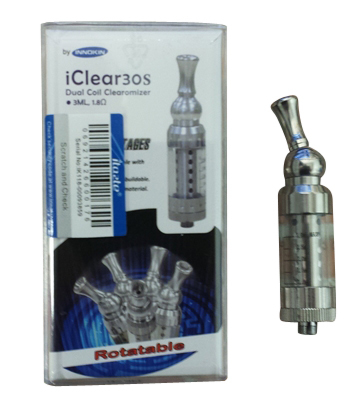 Another great feature of the iClear30S is the large 3ml chamber for holding e-liquid. This means vapers can vape longer between fills, uninterrupted. The iClear30S utilizes a rotatable mouth piece with an innovative 360 degree rotating design. These mouth pieces are designed to swivel around, providing a more comfortable and enjoyable vape!